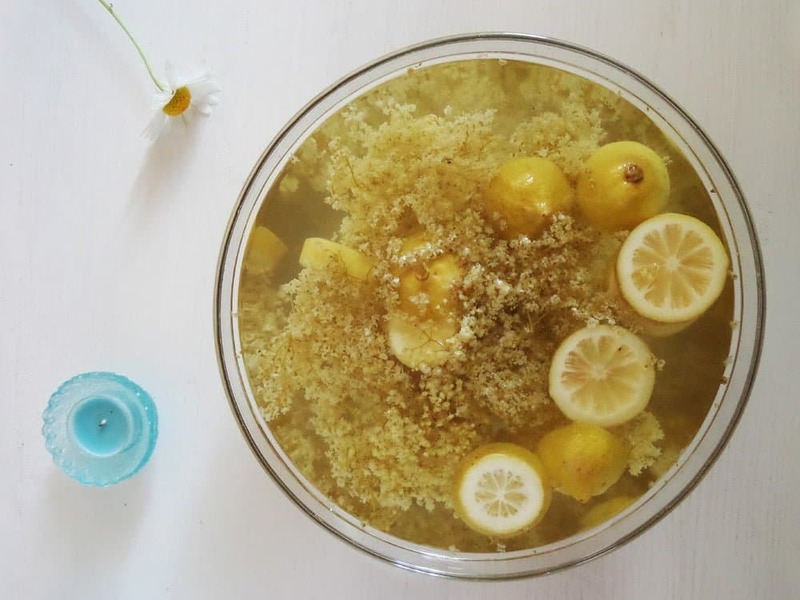 Summer flavors in a bottle – a recipe for homemade elderflower syrup or elderflower cordial: sweet, lemony and more aromatic than any other syrup I know. I wasn’t sure about the right way of spelling sirup. Either sirup or syrup. So I googled it and found this: Syrup is an alternative form of sirup. As nouns the difference between syrup and sirup is that syrup is any thick liquid that is added to or poured over food as a flavoring and has a high sugar content also any viscous liquid, while sirup is (obsolete) a thick and viscid liquid made from the juice of fruits, herbs, etc, boiled with sugar. This elderflower syrup is made from flowers and boiled with sugar so “sirup”, but you can pour it over pancakes or ice cream for instance as a flavoring, so “syrup”. In the end is whatever you prefer. I chose syrup now, because after looking here and there, I feel that most people use the form “syrup”. Elderflowers are the blossoms of the elder tree, also known as Sambucus nigra, Black Elder, Ellhorn, Pipe tree, Bore tree, Eller and Holler. The elder trees are small hedgerow trees and their blossoms – the elderflowers – are creamy colored, have a heavenly scent and can be picked in June. I love the smell of the hedges every early summer and the look of these beautiful flowers. What to do with elderflowers? This year I’ve made only the syrup, hopefully I still have time to pick some more elderflowers to make the juice as well. The season for elderflowers is sometime in June. It is a short period of time, so make sure you don’t miss it. Pick large, unblemished elderflowers. The flowers should be fully opened and very fragrant when ready to pick. Snap the elderflowers underneath the head of the flower where all the small stems meet the large stem. Pick only a few flowers from each tree, the berries that develop from the elderflowers can also be used later in autumn and are also important for insects and birds. The most important thing should be that you find a hedgerow that is not close to the road, I always pick the elderflowers in the fields. Give the elderflowers a good shake to make sure that any small insects are removed. I don’t wash the elderflowers, as I’ve said I pick them in places where there is absolutely no traffic. But if you would like to wash them anyway, then give them just a very very brief rinse in running cold water. However, be aware that washing the elderflowers would remove the pollen and much of the flavor. Pick the elderflowers preferably on a dry sunny day, they should not be wet from the rain. Bring them home and use them immediately, they will become limp and loose flavor quickly. 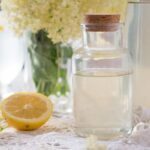 How to make elderflower syrup? Make sure you use organic, unwaxed lemons, which should be washed with hot water before you use them. Before straining the liquid, give the lemon slices a good squeeze, so that their juice remains in the syrup. Citric acid is very cheap and can be bought in just about any supermarket in Germany, if you cannot find it there, then you should definitely be able to find it in a pharmacy/drugstore. There is a lot of sugar in the recipe, I know, but this is a syrup which should always be topped with lots of water before you drink it. I usually mix one part syrup for 3-4 parts water, but that’s according to taste. My kids like it sweeter, I like it less sweet. And I always add fresh lemon juice to the glass when we are drinking, it makes the drink even better. 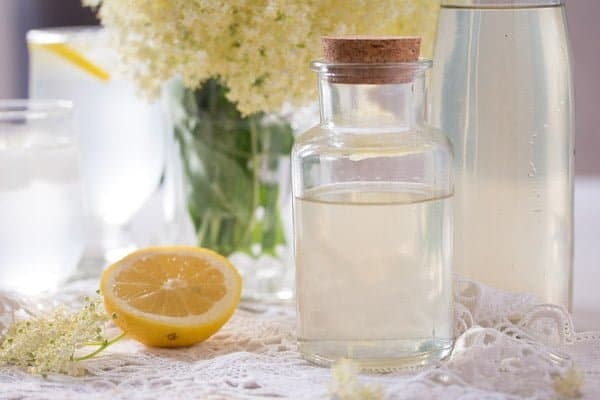 Making this Homemade Elderflower Syrup or Elderflower Cordial is very easy, but you need a little time as the syrup needs to be left alone for 1 or 2 days. I usually give all the ingredients to my largest glass bowl, cover the bowl with cling film and bring the bowl in the cellar. If you don’t have a cellar, any darker cooler place would do. If the weather is very warm, I only let the elderflowers in the water for about 24 hours, if the weather is not that hot you can leave them for 36 hours. After this time, strain the liquid through a very fine sieve. If the sieve you have is not that fine, line it with a clean muslin cloth. There should be no impurities left in the liquid. 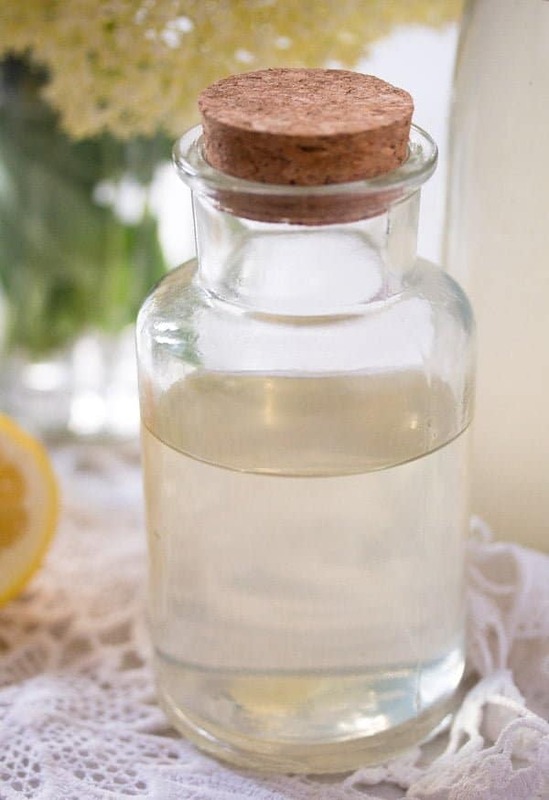 Give the elderflower liquid to a clean pot, add the sugar and bring to a boil while stirring well to dissolve the sugar. Boil for 3-4 minutes. Pour the elderflower syrup immediately into sterilized and still warm bottles. For more information on sterilizing jars or bottles have a look at this post: Simple Apricot Jam and How to Sterilize Jars. What to do with elderflower syrup? 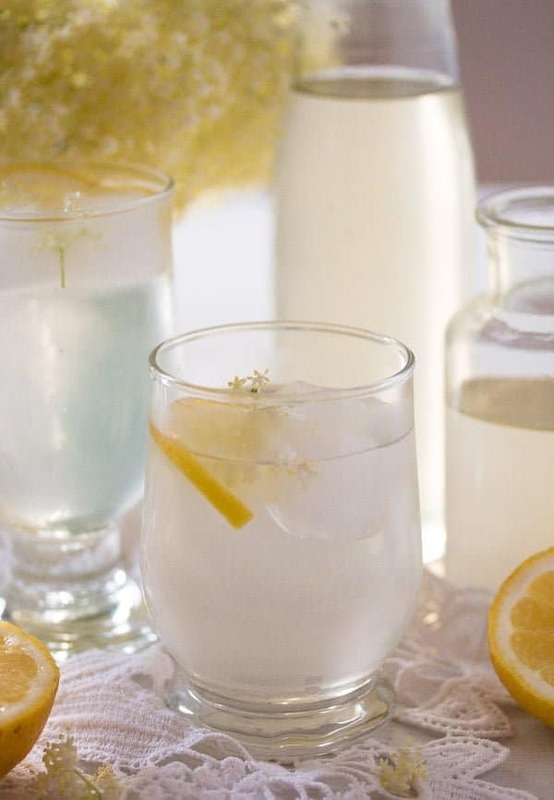 The Elderflower Syrup or Cordial is quite thick and sweet, so a little goes a long way. You can pour just a little bit of it in a glass and fill the rest with sparkling water and ice. Don’t forget to squeeze extra lemon or lime juice in the glass, it will give it an extra lemony tanginess, which I find great. The syrup keeps very well and you can use it the year around either as mentioned above or as flavoring for sparkling wine, gin and tonic or other drinks. You can use it as a sweetening or flavoring agent to make desserts or you can pour a little of it on your pancakes or ice cream. 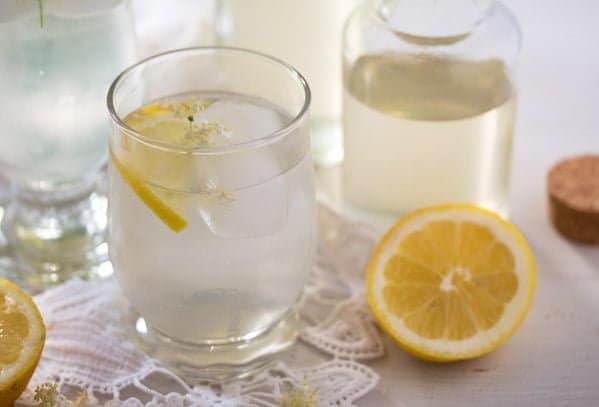 You can use the elderflower syrup or cordial in baking to moisten cake bases before you fill them, you can flavor cake fillings with it, you can make elderflower ice cream or sorbet, you can even use a little of the syrup to flavor and lightly sweeten salad dressings. The recipe can be easily doubled or tripled, I always do that, I don’t really bother for just 1 liter. The syrup keeps very well, I still had a little bottle I’ve made last year and which I opened recently. It was perfect. 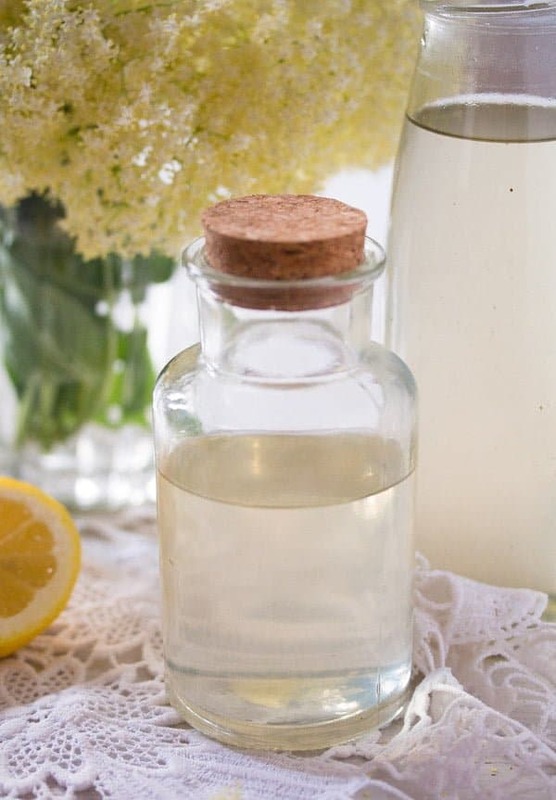 Once you open a bottle of elderflower syrup or cordial, keep it in the refrigerator and consume as soon as possible. Shake the freshly picked elderflowers to remove any small insects that might be crawling around. If you want to wash them, rinse them very briefly in cold running water. However, be aware that washing the elderflowers would remove the pollen and much of the flavor. Give the flowers to a large glass bowl. Cut the lemons into thick slices. Give them to the bowl as well, add the water, cover and leave for 24 to 36 hours in a cool, dark place. A cool cellar would be best. If the weather is very warm 24 hours should be enough, if the weather is not that warm, you can leave the syrup for 36 hours. 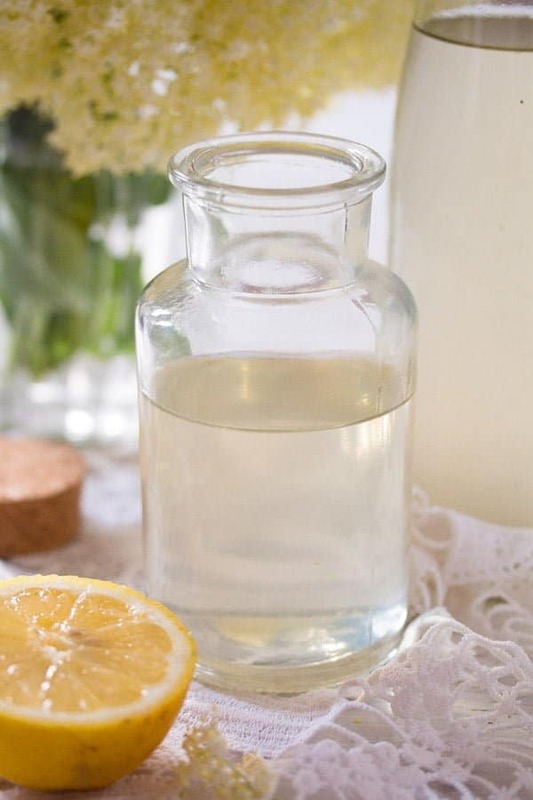 Squeeze the lemon slices into the syrup and then strain the liquid through a very fine sieve into a pot (line the sieve with a clean muslin cloth, if the sieve is not that fine, there should be no impurities left in the liquid). Add the citric acid and the sugar. Bring to boil while stirring well to dissolve the sugar. When it starts boiling, cook for 5 minutes. Pour hot into sterilized and still warm bottles. For more information on sterilizing jars and bottles, have a look here. The elderflower syrup or cordial will keep for at least 6 months, probably longer. Store in a cool, dark place. After opening a bottle, store it in the refrigerator. A large one should be about as large as your hand when you spread the fingers lightly. If they are smaller, take more elderflowers. Always pick the elderflowers in the fields or gardens, places where there is no car traffic. What a beautiful recipe and I loved the story about your childhood! Wish I had had this recipe 40 years ago when I lived in Louisiana. our backyard was surrounded by elderberry and it was beautiful when it was in bloom, and lots of blooms there were. In the New Mexico climate elder berry doesn’t grow. That’s a shame because I would love to taste this syrup. Wonderful little recipe Adina.